Everyone can probably agree that wine gets better with age. Not only does it become smoother in taste, it has a better taste and is less acidic than when it is first bottled. A couple of years inside your self-storage unit can help transform your bottles of wine into something fabulous that you can share on special occasions. However, it is important that you properly store your wine to ensure that it ages nicely and is not stagnant when you open the bottle. Aging your wine is not as easy as it sounds, and you cannot just put it in a box and forget about it with the hopes to open it up 20 years later and enjoy it. You need to make sure the conditions for your wine are just right to prevent spoilage. Below, we will introduce you to what wine storage is, what conditions you need to store your wine in, and answer some common questions about wine and self-storage. Wine storage is a place where you can safely store your wine and the conditions are right to prevent your wine from spoiling. You can find wine storage all over, but before you settle on somewhere to store those precious bottles, you want to make sure the unit meets all conditions to preserve the wine. Businesses can store wine to ensure it ages properly. This is common in steak houses or upscale restaurants where you can purchase wine by the bottle. If you are a wine enthusiast, you will find that wine storage is your best friend. You can store your collection in a safe place where it will age to perfection. Since you can choose a storage unit of any size, you can store a wine collection of almost any size. You do not have to be a wine enthusiast to utilize a storage unit to store your wine. Individuals who enjoy drinking a smooth glass of wine can make use of a self-storage unit. Since your collection of wine is unlikely to be large, you can use a smaller unit to keep your favorite bottles. If you plan to store wine, you want to make sure you opt for a climate-controlled unit. Yes, the price may be a bit higher, but there are many specials out there that you can take advantage of. Humidity, light exposure, and temperature are the three greatest concerns when it comes to wine. You need to avoid all three at all costs, especially humidity and temperature. A dedicated wine storage unit can maintain the proper temperature and humidity for you to be able to store your wine. Your search for a good climate-controlled unit can start online. Simply look up wine storage units in your area and you should find several results. Once you have some facilities in mind, take a moment to call them and ask if they offer dedicated wine storage units. If you cannot find a wine dedicated storage unit, a typical climate-controlled storage unit will usually be enough to keep your wine cool and safe. Finding a climate-controlled unit is not hard, but before you settle on any one, do inspect the facility and make sure the temperature and humidity meets your wine storage needs. If you have decided that you want to store your wine in a dedicated or non-dedicated wine self-storage unit, it is time to decide on what size you need. Remember, the most important thing to keep in mind as you choose the right sized unit is to consider how much space you need now and how much space you may need in the future. For example, if you have a small collection now and do not plan to expand it, you may be able to get by with the smallest sized unit. However, if you want to expand your collection, you would want a larger unit to allow you to do that. Below, we will look at some of the most common sizes of storage units used for wine. A 5x5 unit is equivalent to about 25 square feet of space. This is the smallest sized unit, but it holds a good amount if you only need a small space. As a reference, the space is the size that you could store a few boxes, tools, and office supplies or filing cabinets. A 5x10 unit is equivalent to about 50 square feet of space and as a reference for size; it would be perfect if you want to store an small office space or one bedroom. This sized unit can hold a lot of bottles of wine and will serve its purpose well for most individual collectors. In addition to the 5x5 and 5x10 units, you will also find that most facilities offer larger sizes such as a 10x10, 10x15, 10x20, and 10x30. These units are very large in size and range from the size of a garage up to a unit that holds 3 to 4 bedrooms. These units are not commonly used for wine storage unless you have a large and extensive collection. We briefly mentioned above that humidity is one of the main enemies of a good aged wine. If your wine does not have enough humidity, you will find that the cork shrivels and dries out. This then leads to air seeping into the bottle. When the air reaches the wine, it causes spoilage and oxidation to occur. Fortunately, many newer bottles of wine do not contain a cork, which allows the wine to be better preserved over time. Humidity can ruin your wine and a dried-out cork is one of the reasons why you need a humidity-controlled storage unit. You also want to make sure you ALWAYS store your wine on its side, horizontally, as opposed to vertically. Doing this allows the wine to remain in contact with the cork, which keeps it moisturized. Another reason you want to keep your wine collection stored in a humidity-controlled unit is because the wine bottle’s exterior and label may become damaged or mold may grow on the label. While this does not affect the wine itself, it is not aesthetically appealing. 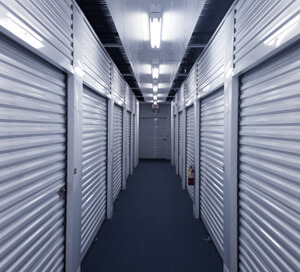 As you look for a storage unit with humidity control, keep in mind that you need your unit to be accessible and you want it to be secure as well. Look for a facility that can keep the humidity anywhere from 70 to 80 percent relative humidity. 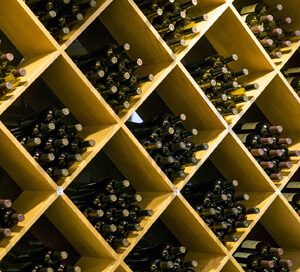 Just like humidity, temperature matters when it comes to wine storage. While you may think that simply placing the wine in a fridge is enough, it may do more harm than good. This is because the air in the refrigerator is too dry for the wine to thrive. Wine DOES and WILL freeze, so you do not want to place it anywhere where it has the potential to do so as this will ruin the wine. High temperatures will destroy the aging process and lead to spoilage as well, which is why a climate-controlled and humidity-controlled unit are recommended. As a rule of thumb, you do not want the temperature in your wine storage unit to rise above 77 degrees Fahrenheit for any extended period. Ideally, your wine should be stored below 70 degrees Fahrenheit for the best aging. The BEST temperature range is somewhere between 50- and 60-degrees Fahrenheit, with the optimal temperature at 55 to 57 degrees Fahrenheit. When choosing a storage unit with temperature control, do make sure the temperature can remain consistent. If the temperature continues to flex up and down, you may find that your wine spoils or does not age appropriately. Storing your wine is a game of precision, time, and patience. It is vital that you store your wine properly to ensure it ages the way you want. Wine is finicky and there is no doubt about that. Below, we will talk about the three biggest things to keep in mind as you store your wine. You do not want to rush the wine’s aging process and you really can’t either. What we mean by that is that you cannot turn the temperature down lower and hope that the wine ages in half the time. It takes time and patience. Of course, the ideal age of each type of wine is different, but you can usually expect a red wine to age in 2 to 10 years while a white wine ages in about 2 to 3 years. Experts warn against vibrations and that it can not only ruin your wine but disrupt the entire aging process. It can also disturb sediment in the base of the bottle and cause your wine to take on a gritty or sandy texture. Vibrations should be avoided completely when storing your wine. Fortunately, your wine storage facility will not likely experience any serious vibrations for any length of time or at all, so you may not even need to worry about it. When you store wine, it should be stored away from other items, especially those that are strong smelling. The reason behind this is because your wine can breathe, and it can absorb strong smelling items such as chemicals, garlic, onion, and so on. It is best to store your wine alone. Organization of your storage unit matters and can help aid in how well your wine ages over the years. You want to make sure you maximize the space you have but you do not want your space to be disorganized either. Some wine storage facilities come with racks and shelves already installed in the unit to help you use the space wisely. If the facility you choose does not provide shelves or racks, you should invest in your own and place them in the unit. When storing your wine, always store the bottles on their side to ensure the cork does not dry out and to maximize your ability to store more bottles. 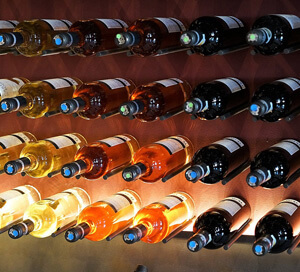 Below, you will find some commonly asked and answered questions about wine storage. Do I need to keep champagne chilled when I store it? No. Champagne does not need to be stored chilled. It is important to follow the tips above on how to store your wine and champagne. When you are ready to drink the champagne, you can chill it before use. Can I place a bottle of wine back into my wine storage unit once it’s been opened? It is not recommended. If you need to store the leftover wine, you should re-cork the bottle and store the bottle of wine in the refrigerator for no more than 3 to 5 days. Do I need to store ready to drink wine the same way as I would store wine for aging? No. Ready to drink wine is just that – ready to drink. You should simply keep this type of wine out of direct sunlight. Can wine be stored upright? It depends. If you plan to age your wine or store it for more than a couple of weeks, you should store it on its side, as this will help keep the cork wet and prevent it from drying out. If you will drink the wine within a few weeks, you can store them upright. Storing your collection of wine is not difficult but it is not easy either. You will need to invest some time, money, and patience into it. A storage unit is a wonderful way for you to keep your wine safe and allow it to age properly. As you search for a wine storage unit near you, remember to look for one that is climate controlled and has a humidity and temperature control option. To search for a nearby wine storage unit, use any of the search criteria below to find a facility by you!